The Kardashian-Jenner family, from left to right, Khloe, Lemar Odom, Kris, Kendal, Kourtney, Kanye West, Kim, Caitlyn and Kylie. There aren't many people who can count themselves in the Kardashians inner circle and there's only one from Ireland. 29-year-old hairdresser Andrew Fitzsimons, from Ballinteer in Dublin, has landed a coveted spot as the go-to hair guy in one of the most influential families in the world. Fresh from Costa Rica, where he joined the family on their much-publicised trip to tend to Kourtney's tresses, we spoke to Andrew about moving from a salon on South William Street to working with the most famous women in the world. While you may not recognise his name, there's no doubt that you will recognise his work. Andrew lists Ashley Graham, Joan Smalls, Kendall Jenner, Irina Shayk and Bella Hadid among his ever-growing list of celebrity clients and he is the magic hands behind countless iconic Kardashian hairstyles, with the most recent being Kourtney's undone, beachy waves that sashay beyond her waist. And nowadays he works with the mother-of-three almost every day. In short, if you're looking for an 'it' boy in the beauty industry, it's him. Before he was mingling with Hollywood elite, he was honing his craft at home in Dublin and fighting standard expectations for him to stay in school and play rugby. "When I was younger, Dublin was not the place for a young, sensitive, gay boy. I know it’s changed a lot now and Ireland was one of the first countries to pass the gay marriage vote, and I’m very proud of that," he told Independent.ie Style. When Andrew was 13, his mother got him a summer job in a salon, which went on to be the foundation of his career in hairstyling. "After working in the salon for the summer, in September of second year I went back to school and I realised it was the wrong place for me. I wanted to be out working and give myself the education I wasn’t getting. I was happy to leave and be good at something. Two weeks later, at 14 years-old, I made the executive decision to leave school, much to my mum’s dismay." "She made me make an agreement to take my job seriously, be responsible, work full time and get to the top of my field. It’s been 16 years since then and I haven’t taken one sick day, and I’m still trying to reach the top of my field," he said earnestly. "I knew leaving school so early would affect the rest of my life. The structure of life and education did not cater to me. I was told: 'You need to change, to play rugby.' But I chose to create my own reality. I was determined." After leaving school, Andrew spent a couple of years working as an apprentice and soon became popular with celebrities on home soil including Grainne Seoige and Miriam O'Callaghan. "I was doing small jobs for advertisements and editorial work as a hair stylist when I did Grainne’s hair for a day time talk show on RTE. We got on really well and I learned a lot from her." "I really respected her hustle and drive and she taught me a lot about professionalism and taking a job seriously. In Paris, New York and Los Angeles that’s the attitude that successful people have. She’s the first person I learned it from first hand, and I’m really glad I did." Despite having built up his experience as a hairstylist and forming a steady clientele in Ireland, Andrew felt that Dublin "wasn't the place" for him and dabbled in Paris before eventually taking the leap the Big Apple at the age of 29. "I wanted to be around people who lifted me up, so I changed location and moved to Paris when I was 17 or 18." "I didn’t love fashion enough to be miserable in Paris with no money, so I moved to New York; the holy grail of every industry." "When I moved to New York, I had to start all over again. I had to start hustling. I had no money. I had my suitcase and my kit but I didn’t have $2. I started doing test shoots. If I had an ego when I was working, it would have ended my career," he explained. "I used to walk for two hours, rain or snow, to go to a job because I couldn’t afford the subway. I was sleeping on couches, doing anything I could to put myself out there and learn. I was getting everything I needed from work – it fulfilled me that way." Clearly, Andrew's hustle and dedication to his work paid off when he landed the job of working with the one of the biggest artists to come out of the 21st century - Adele. "She was promoting her album 21, and we got on so much. We p***ed our pants laughing together. It was great to talk to someone from the UK. We talked about how much we loved Cheryl Cole because that’s when she was trying to break America for the X Factor." Nonchalantly, Andrew adds: "That was my first stepping stone. Then I worked with Mariah Carey for a few years and it all stemmed from there." It was by sheer coincidence that Andrew began working with the Kardashians, which went on to be a defining moment in his career and led him to Instagram stardom. "I was working on an advertisement and I was asked if I wanted to stay around to do the hair of a new face that was coming in after," he said. The new face? Kendall Jenner. "She was very quiet, sitting on her phone. This was when she was trying to make it as a model in New York. She was amazing for the whole shoot. She was transforming into a celebrity in her own right," he said of their introduction. 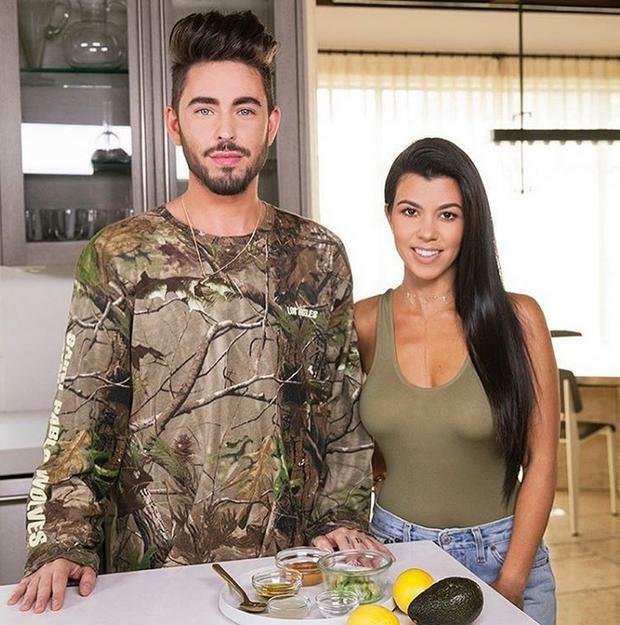 Staying around to do Kendall's hair opened up a treasure chest of clients for Andrew, who has landed an exclusive gig as Kourtney's personal hair stylist. "I worked with the family in New York two years ago for Fashion Week. I think it was Kanye’s first season for Yeezy. I did Kourtney’s hair and when she walked in we were both wearing the same outfit; a band tee, ripped skinny jeans and boots. We got on really well. "Kourtney, Khloe and Kim are the most down-to-earth, sweetest people I’ve ever met. They’re always on time. They’re so professional, friendly and work so hard. They remember the details you told them the last time you were working with them. I’m blessed to be working with them." "I have great self belief and I knew if I applied myself and believed in myself I could go where I needed to go." Never one to settle too long in one spot, he has upped sticks once again and lives in Los Angeles, the City of Angels. "My boyfriend (Jeffrey Bowyer-Chapman) is an actor and he shoots in Vancouver, so it suits us both well. It’s so weird to see palm trees and blue skies after coming from Ireland." Despite his nomadic lifestyle, Andrew's heart remains firmly in Ireland. "Irish people love to look good. They love their hair and makeup. Irish people are starting to look after their skin, which is great. I think there’s less fake tan and backcombing too." "I’d love to bring out my own extensions or own a collection of products in the future, maybe start a few salons," he drifted off, with the cogs turning in his head almost audible. One thing is for certain - the future looks very bright for Andrew Fitzsimons.